It’s always easy to know when there’s an election on the way in Australia, especially in NSW, as all parties commit to new projects big and small. Top of the list are new infrastructure projects – hospitals, roads, and, increasingly, public transport – with their seductive promise of a shiny new future, ushered in by ribbon-cutting politicians. But what if you are in government and have already started planning or constructing several large infrastructure projects, or you are in opposition trying to differentiate yourself while supporting at least some of the government’s proposals? Well, the next best thing to a new project is to “refresh” an already-announced one, for example by proclaiming that extra funding has been earmarked for it, that work will begin sooner, or that it will be “fast-tracked” – even if the project remains largely unchanged. Recent announcements about the Sydney West Metro by both major political parties in the run-up to the 2019 state election provide excellent examples. A few weeks ago NSW Opposition Leader Michael Daley’s committed to spend $8 billion to “fast-track” the planned line. In the last couple of days the government responded, with the NSW Premier Gladys Berejiklian and Transport Minister Andrew Constance announcing that $6.4 billion would be set aside for the project and that construction will begin a year earlier than previously planned, in 2020. The premier also committed to reducing journey times between Parramatta and the city via the metro to around 20 minutes. Despite all these promises it is unlikely that the project will be completed significantly earlier than 2028 – and neither the government of the opposition’s funding announcements will be nearly enough to complete the metro, given its $16 billion estimated cost. However, the announcement did provide more details regarding the government’s proposed route and preferred station locations, coming shortly after the Sydney Morning Herald’s documentation of the sites of intensive geotechnical investigations for the project and my most recent article which used this information to try to assess the most probable corridor. While they have both refreshed their commitments to the project, the announcements mean there is now some differentiation between the parties in their approach which have some interesting implications. Sydney West Metro: potential corridor and station site options. Sources: Transport for NSW, SMH, Coalition/ALP statements, Google My Maps. (Map assumes Rydalmere corridor is selected). 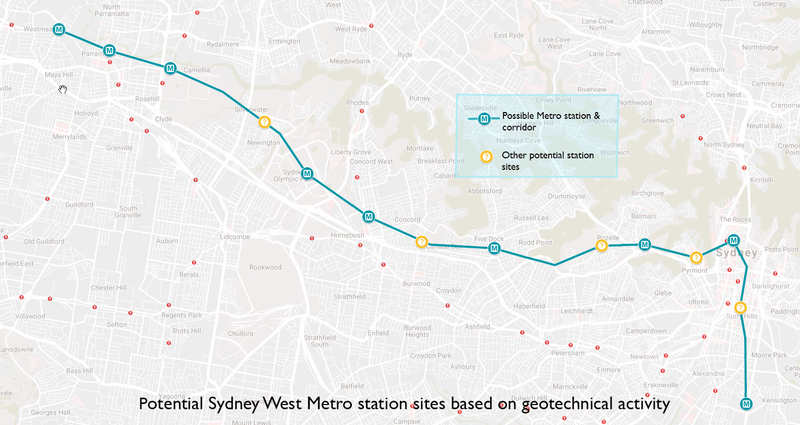 In 2018 I published a series of articles speculating on the likely route and station locations for the proposed Sydney West Metro. In the final article I concentrated on the CBD, commenting that geotechnical investigations for the project may provide some clues regarding potential station sites. That work has continued, and now the Sydney Morning Herald has mapped many of the locations where geotech activity has taken place, revealing areas of concentrated investigation along the route. Meanwhile the Minister for Transport has indicated that there will be a maximum of nine stations. While there have been no formal announcements regarding specific locations, the options seem to be narrowing. They suggest that my previous comment that Martin Place station could become the “new” Sydney Central could well be an understatement, with an underground walkway set to provide a potential corridor across the CBD, potentially linking up to five CBD metro and rail stations. 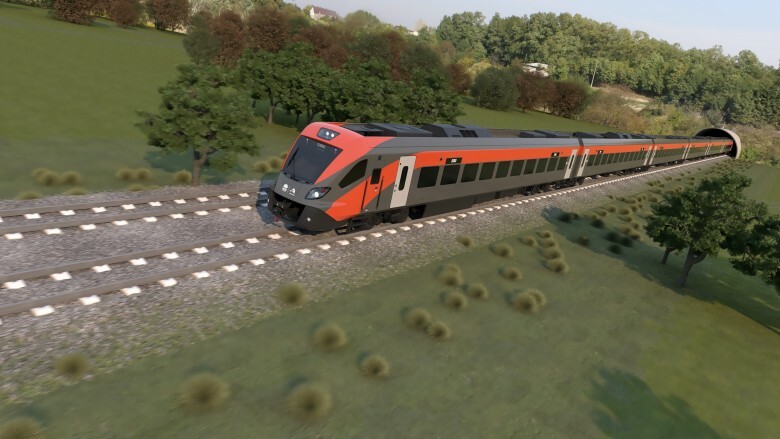 In signing a $1.26 billion contract with the Momentum Trains consortium for a new regional train fleet to be operated by NSW TrainLink the NSW Government seems to have learnt a few things from its chastening experience in selecting Hyundai Rotem’s offering to replace the intercity trains. As part of the deal Spanish manufacturer CAF has been contracted to supply 29 trains based on its Civity platform. Unlike the intercity fleet, these trains will involve some local manufacture and assembly and will be maintained in rural NSW, with the bulk of the remainder of the $2.8 billion contract covering a new service facility to be located in Dubbo and maintenance of the trains for 15 years. The government also appears to have avoided two other key aspects of its mishandling of the intercity trains agreement – at 2.88m width, the regional trains do not appear to require any major changes to rail infrastructure, and unlike the unpopular fixed seats in the intercity trains, seating in the regional trains will be reversible. CAF also seems to have had a lot more experience in manufacturing the train it is contracted to provide than its Korean counterpart has had with making double-deck intercity trains. However, key questions remain – are the new regional trains going to be the best ones for the job and will the new fleet support the network’s future development? 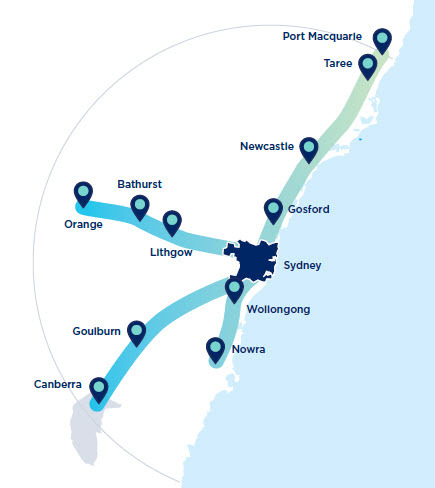 The announcement by NSW Premier Gladys Berejiklian that the NSW government “would start work on a fast rail network in the next term of government” has already been criticised as being a repeat reading from a very hackneyed script. True to form, the announcement was made less than four months out from an election by a government fearful of losing rural and regional seats. We all know the storyline – a government announces a High-Speed Rail (HSR) study with great fanfare or a private sector group promotes its own proposal for an HSR line. There is a bit of media coverage, route options are debated, and experts are wheeled out to proffer their opinions. Then a few months later – and in the case of government-led proposals, usually after an election – the proposal is shelved, invariably on cost grounds. Despite the cynicism there are some worthwhile aspects of the approach the NSW government is taking this time round which are worth exploring. One of these is the similarities with the successful regional rail strategy adopted by its Victorian counterpart. I had intended to write a postscript to my series on the ideas of the engineer John Bradfield and their impact on Sydney in commemoration of the recent 75th anniversary of his death on 23 September 1943, but the NSW Government has, in a sense, beaten me to it. Recently the government announced plans to transform the abandoned tunnels and platforms at St James Station which Bradfield constructed into an entertainment and tourism precinct housing bars, restaurants, shops or galleries, all occupying 6,000 square metres of underground space. This announcement provides a coda to the last article in my series which touched on the abandoned tunnels in discussing Bradfield’s plans for what was effectively a “missing metro” through Sydney’s inner suburbs. The tunnels formed a key component of Bradfield’s plans. In this light is the announcement by NSW Transport Minister Andrew Constance the wise recycling of redundant assets to encourage tourism, or a short-sighted takeover of valuable public transport infrastructure? It’s worth taking a look at why the tunnels were built, what the government is proposing to do with them and the potential, if any, for their use as transport corridors. Mr Constance states that “the platforms and tunnels were intended to link the Eastern Suburbs with the Northern Beaches but the plans were never completed”. This is incorrect. Bradfield may have changed his ideas a few times, but it was clearly the lines across the Harbour Bridge that were always intended to prove a northern beaches link – not the tunnels at St James. In fact, while he proposed an interchange, Bradfield never planned a direct connection between his eastern suburbs and northern beaches lines. Bradfield’s 1925 City Railway plan. Source: R Raxworthy (1989), The Unreasonable Man. In commemoration of John Bradfield on the 75th anniversary of his death on 23 September 1943, I’m writing a series of posts exploring some of the ideas outlined in his 1924 engineering doctorate thesis and their relevance for Sydney a century later. Please see part 1 for the background to this series, and follow these links to part 2 and part 3. While Sydney’s Harbour Bridge and its underground CBD railway are enduring testaments to the way in which engineer John Bradfield shaped this city, they represent only part of a grander vision. Bradfield thought big. He wanted to solve the chronic traffic problems of Sydney in the early 20th century and provide a foundation for its continued growth by giving it a modern rapid transit rail system, based (as described in the previous article) on the latest European and American technology. 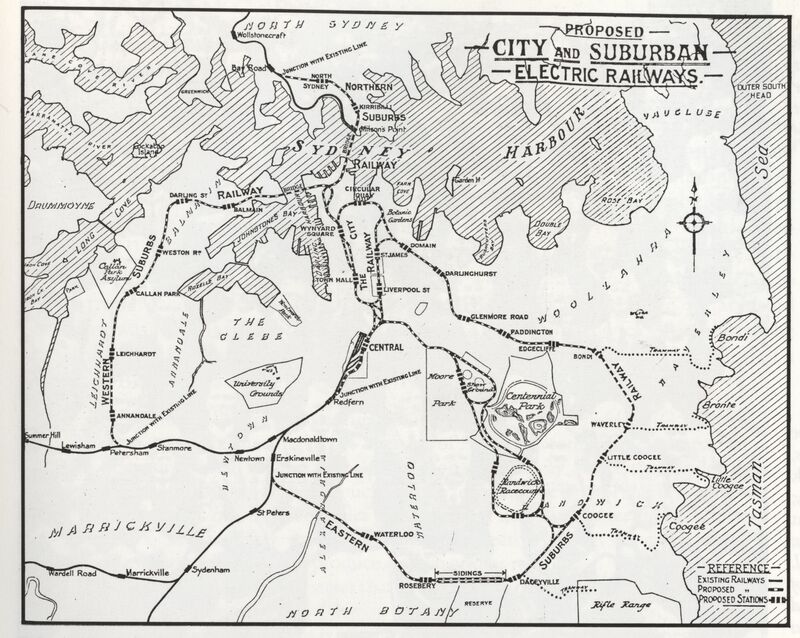 He wanted to extend this rail network to the edges of “greater Sydney” as it then existed, but also to lay the foundations for rapid transit within the city’s inner suburbs. At the heart of this network was the bridge and the CBD railway, but Bradfield also proposed three additional lines that would have filled the gaping holes in rail coverage in the inner city. Unfortunately, these were never built as Bradfield planned – had they been completed Sydney would in effect have gained a metro, a full century before the one currently being constructed, and consequently would have been a very different city to the one we know today. This is the story of these abandoned and largely forgotten proposals and of the city that might have been. As the 75th anniversary of John Bradfield’s death on 23 September 1943 approaches, I’m writing a series of posts exploring some of the ideas outlined in his 1924 engineering doctorate thesis and their relevance for Sydney a century later. Please see part 1 for the background to this series, and catch up with part 2 here. The first name for the Sydney Metro when it was announced in 2012 was Sydney Rapid Transit, with much being made of the “new rapid transit system” and its ability to carry thousands of people per hour. The name has since changed but the fundamental premise, that a new breed of single-deck trains operating at high frequencies represents a step change for users of the Sydney rail network, remains the same. 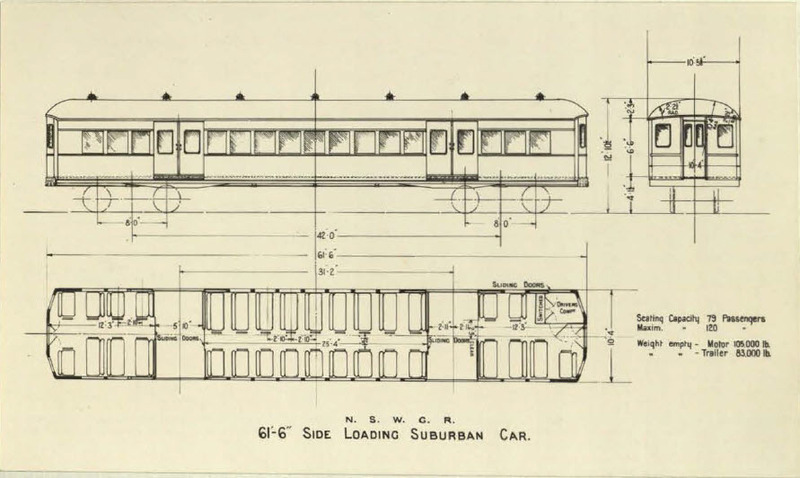 This would have surprised John Bradfield because the concept of rapid transit was at the core of his plans to modernise and expand Sydney’s rail system a century ago. Why then is rapid transit being reinvented for the Sydney Metro, and what has changed in the past 100 years? The original idea seems to have been to connect the various stations of the railways leading out of town, and to do this, and at the same time furnish means of rapid transit from the heart of the city to the suburbs… In this way London has solved its rapid-transit problem, though it could be done only at enormous cost. By the time Bradfield travelled to Europe and North America in 1914 to study the latest metro and subway systems the term rapid transit was in common use; the Brooklyn Rapid Transit Company was formed in 1896 and the Interborough Rapid Transit Company opened in 1904 as New York’s first subway line. Bradfield made detailed observations of these systems, carefully documenting the speed, frequency and dwell times of trains for his 1916 Report on the proposed electric railways for the City of Sydney. This report also outlined his rationale for a rapid transit system in Sydney and how it would work.